White House press secretary Sean Spicer said on Tuesday that a suspected chemical attack in a Syrian town was a "consequence of the past administration's weakness and irresolution." "Today's attack is reprehensible and cannot be ignored by the civilized world," Spicer told reporters. "These heinous actions by the Bashar al-Assad regime are a consequence of the past administration's weakness and irresolution. President Obama said in 2012 that he'd establish a red line against the use of chemical weapons and then did nothing. The U.S. stands with our allies across the globe to condemn this intolerable act." U.S. Secretary of State Rex Tillerson, who was meeting with King Abdullah II of Jordan at the State Department in Washington, ignored questions from reporters about the chemical weapons attack. The Department of State later released an official statement condemning it. And Nikki Haley, the U.S. ambassador to the U.N., tweeted that the Security Council will hold an emergency meeting Wednesday morning. "Assad must be held accountable for these barbaric attacks against his own people," she wrote. The alleged Syrian government airstrike, in the town of Khan Sheikhoun in northern Syria, killed at least 72 civilians, including 20 children, according to the Syrian Observatory for Human Rights, a U.K.-based monitoring group. The Syria Civil Defense and the Health Directorate in Idlib said that more than 50 people were killed and 300 injured. Syria's military denied using chemical weapons against civilians, saying it is too "honorable" to carry out such "heinous" crimes while the Syrian Foreign Ministry said Damascus is committed to its obligations under the Chemical Weapons Convention it joined in 2013, denying its military has used such agents in today's attack. If confirmed the incident would be the deadliest chemical attack in Syria since sarin gas killed hundreds of civilians in the Damascus suburb of East Ghouta in August 2013. Russia on Wednesday blamed Syrian rebels for the attack -- saying that the Syrian Air Force struck a warehouse where opposition militants were storing chemical weapons. Tuesday's attack appeared to involve a gas that caused victims to choke and faint, according to the Syrian Observatory for Human Rights, Syria Civil Defense, medics and residents. Warplanes later struck the town again, hitting a hospital where some of the victims were being treated and a Syria Civil Defense center. "What moved us most was when we entered a house and saw a whole family - a father, a mother and four children - killed because of the chemical attack," Abdullah al-Hussein, a Syria Civil Defense volunteer who was at the scene, told ABC News in a voice recording in Arabic. "They had been asleep. They were in their beds. The truth is that what happened today was painful in all meanings of the word." He said that many residents were still asleep when the attack happened in the early morning. He saw more than 100 injured people and at least 20 bodies of children, women and men at one of the hospitals tasked with treating victims, he said. Muneer, a schoolteacher who lives in Khan Sheikhoun, said he was alone at home when he heard the attack. "I hid in the corner of the room," Muneer, who asked that his last name not be published, out of security concerns, told ABC News via a messaging app in Arabic. He said he lives in the center of the town and the attack took place in the northern part. When he later tried to approach the area that was struck, people told him not to go any farther. "They warned me that I would faint if I came close," he said, "so I stopped walking." He said schools were closed today. 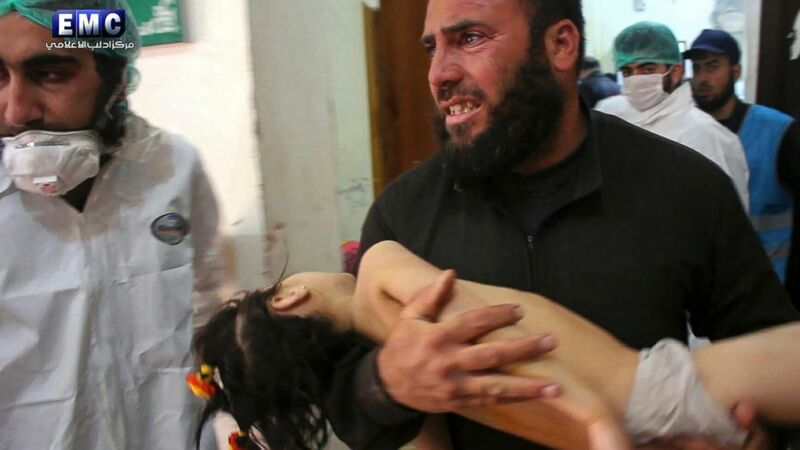 Doctors in Syria who treated some of the victims told ABC News that they saw patients with pinpoint pupils, foaming at the mouth, loss of consciousness, slow breathing, running noses and other neurological symptoms consistent with chemical weapons. "The hospital in Khan Sheikhoun was filled with injured children, women and men, and a smell of chlorine was filling the place," Mohammad Alshagel, a media activist with the Aleppo Media Center who visited the hospital, told ABC News. "The injured had heavy choking symptoms, and some of them died five minutes after arriving, even though medical staff tried to help them." He said the hospital was attacked after he left. He has witnessed the aftermath of several chemical attacks in Aleppo and they were not as bad as this one, he said. "It was a horrible scene. Children were crying, asking for their parents who had died, and women were screaming," he said. Raed al-Saleh, the head of the volunteer Syria Civil Defense, or White Helmets, told ABC News that five rockets hit the group's center in the town, destroying equipment. The attack comes as world leaders and diplomats gather in Brussels for talks on the future of Syria and the region. Two days ago, an airstrike hit a hospital near Khan Sheikhoun, injuring at least one patient and one nurse, according to the Syrian American Medical Society. Tuesday's attack comes after two other recent suspected chemical attacks in Syria. According to the group, on March 30, barrel bombs containing chemical agents injured 166 civilians and seven medical staffers in Hama in western Syria, and on March 25, two people were killed, including Ali Darwish, a specialist orthopedic surgeon, in another chemical attack on a hospital in Hama. The Organization for the Prohibition of Chemical Weapons said in a statement that its fact-finding mission is in the process of gathering and analyzing information from all available sources about today's suspected chemical weapons attack. "The OPCW strongly condemns the use of chemical weapons by anyone, anywhere and under any circumstances," the organization said in a statement.